although the stars were not as bright with a few days to full moon. 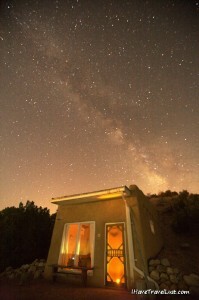 The milkway was not as visible as it should be to the naked eye due to the bright moon and the light coming from the other adobe buildings and from Buffalo Thunder in the distance. How sensitive the stars are even with little light pollution from the surroundings! This is my favorite adobe building in Cuyamungue, it’s not on the electrical grid and is only lit up with candlelight in this image. It was mentioned to me that Felicitas used this building as her little retreat while she was living in the land. 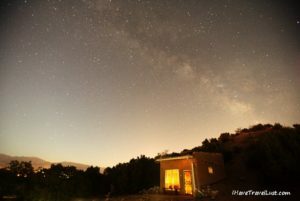 The month of July is the best time to view the milkyway, so if you are still out in the open dark skies, grab a chair or a sleeping bag and watch the milkyway rise around 11pm in New Mexico. Also in July, get up early around 4am in New Mexico Time and witness the conjunction of Jupiter, Venus and the brightest visible star, Aldebaran as they rise from the horizon. They will seem so big that you might think they are colliding towards Earth! I was too in awed in my groggy state to photograph the conjunction, when I saw those rare planetary and star lined up as they rise up just before dawn.